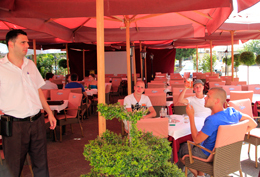 Menu consists of the list of meals we prepare at our restaurants in Rovinj and Pula. The latest news on our restaurants, celebrations, banquets and tourist group discounts. In this section you can find out how to contact us, how to find us and to book a table online. Da Piero II is a high quality restaurant of rich tradition, with Mediterranean cuisine and Istrian specialties, excellent grill and pizzas prepared in the Italian manner. 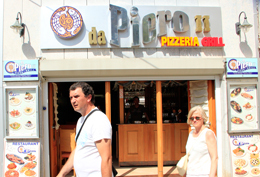 This restaurant from Pula is one of the brand restaurants with the same offer and same name da Piero. With its spacious terrace it is situated near the Temple of Augustus and the beautiful Forum square, surrounded by a park, little streets full of life and parkyard. Due to its appealing offer of specialties and attractive charmy location it has been very popular for years. Daily rich offer of Mediterranean and Istrian cooked brunches, meals and dinners including extremly popular prices is and attractive combination of everything that makes this place gladly visited by the tourists in Pula, all business people in the area and especially romantic couples, who come to enjoy the unique Istrian delicacies after an evening walk. Restaurant offer consists of various Istrian specialties, which earned reputation to this famous chain of restaurants da Piero in the 16 years of its egzistence. The offer includes the Mediterranean cuisine with fish dishes, shells, crabs, pasta, black risotto, grilled meat specialties, pizzas and creative vegeteranian meals. The groceries are bought fresh from the market nearby and every morning the cooks prepare everything there is to offer, they also make fresh desserts, bake their own bread and make pasta. This makes them different from many other restaurants. Their offer includes only the high quality olive oil, goat and sheep cheese, Istrian prosciutto, truffles, homemade pasta and few kinds of homemade bread. Carefully selected and high quality Istrian and Croatian wines of the famous wine producers are also in the offer: Kozlović, Degrassi, Zigante, Krauthaker, Zlatni plavac, Dingač, Postup, Iločki traminac, Zeleni silvanac, and the traditional alcoholic beverage rakija is also in the offer Istarska grapa, Istarska biska, Medovača, Vilijamovka, Šibenska lozovača. We come here every day and we always try something new. Everything is deliciously prepared, it is fresh, tasty and healthy... and kids love it. I have to admit that we are still testing them... but they didn't do anything wrong yet. This is hers and mine favourite summer game, we make them try hard to win us over. What is there more to say, they really are good, aren't they?